Category pages and browse grids are important to optimize because they target the keywords that consumers search for. But the optimization process can be difficult since the pages tend to have the least content. By adding features that increase engagement and conversion, optimizing the accompanying text, and, yes, adding some well-placed body copy, your category pages will better communicate their relevance to search engines to attract more shoppers. In this post, I’ll describe six ways to optimize ecommerce category pages. I’ll use, as an example, the high-ranking women’s boots category page of DSW, the shoe retailer. Optimized elements on top-ranking DSW’s women’s boots category page. Click image to enlarge. Starting at the top, optimize the heading tags. 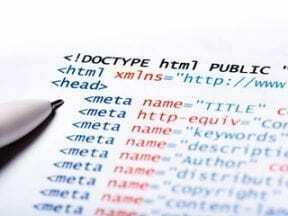 Make sure that the default headings from your ecommerce platform are as optimal as possible. This will likely require working with developers for changes. Alternatively, you may be able to change them yourself, to override those defaults in your platform or content management system with optimal versions. This is the one that designers and brand advocates like the least — the dreaded body copy. Notice how DSW has worked in two sections of body copy: a shorter one at the top and a longer one that caters more to search engine optimization at the bottom. This is brilliant. It avoids the appearance of the text being spam copy just for search engines by placing a small amount at the top in plain sight. But it also leaves open the possibility of having longer text at the bottom where it doesn’t push down the commerce section of the page. Body content doesn’t have to be paragraphs long. In fact, longer blocks of copy that don’t add value detract from a page’s ability to rank. 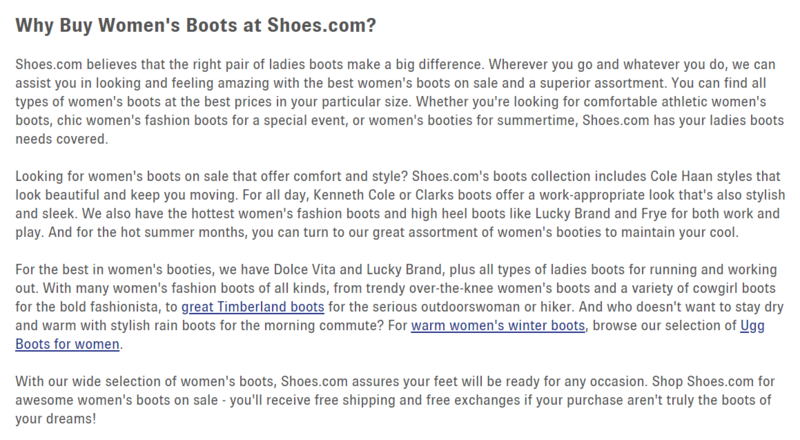 For example, note the length and low quality of the copy on Shoes.com’s women’s boots page, below. This block is found on the bottom of the page, just above the footer. The length and placement aren’t the problems. The problem is the lack of meaningful content other than keywords. Long blocks of copy on Shoes.com’s category pages don’t necessarily help shoppers. Features within your category pages always contain text. They advertise sales items or loyalty programs or other messaging that you want shoppers to absorb. Use every feature to your SEO advantage by optimizing that text. First, make sure that it’s plain text, floated over a background image, rather than embedded in the image itself. While visual search has come a long way, it’s not yet included web search algorithms. Once your content is crawlable text, use descriptive language. For example, the description on DSW’s page reads, ”Sperry Syren Gulf, I love this boot! So comfortable and great in wet, muddy, or cold weather.” Within that text appear the product name and the word “boot” — both are keywords. Also, there are contextually beneficial words describing the conditions in which the boots might be worn. “Click here.” “More information.” These are poor anchor texts — meaningless to search engines. DSW uses “Shop This Style” as the anchor text for the link. Using vague language as link text misses a fantastic opportunity to increase the relevance on this page, as well as on the page that the link points to. Links to other related products — “boot socks” in DSW’s case — are another good opportunity to reinforce the keyword theme. In this case, the product type (“boot socks’) on the women’s boots page also contains the word “boots,” which earns relevance points for containing the keyword for the page as well as for “socks” being contextually relevant to boots. Look for golden keyword opportunities like this. If they’re not available, contextual relevance alone will help. 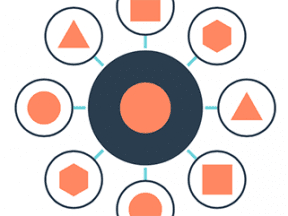 Navigation and filters play an interesting role in content optimization. On the one hand, their primary purpose is to aid shoppers in finding and purchasing products. But they also play a critical role in the indexation, authority, and relevance of each page. Including specifically relevant words in the navigation and filters will benefit your natural search. DSW hasn’t used words for specific keyword relevance in its filters, sticking with “rain” instead of the more specific “rain boots.” In many cases, there isn’t room in the design for an additional word, such as “boots,” making its inclusion impractical. But in cases where the word is shorter, such as “rain” or “duck” or “mule,” DSW could have included “boots” as well. Even without “boots,” however, the filters add contextual relevance, which is important in today’s algorithms. 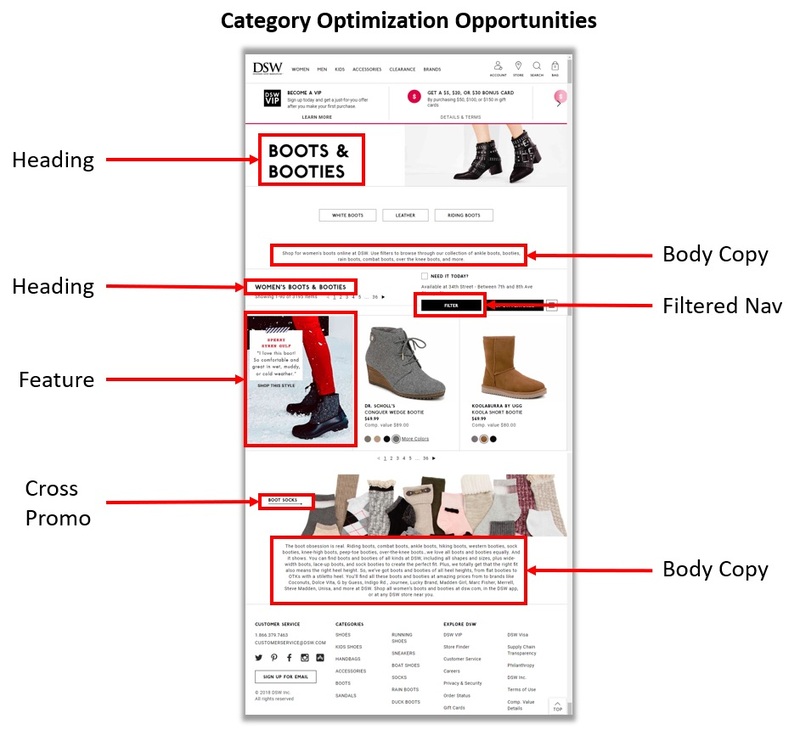 In its navigation filters, DSW hasn’t used words for specific keyword relevance, sticking, for example, with “rain” instead of the more specific “rain boots.” A lack of space in the design for an additional word, such as “boots,” could be the reason for the omission. Optimizing navigation is somewhat of an intellectual argument. Few user experience professionals would agree to include the word “boots” in just a few cases rather than all — consistency being key in UX. But for those hungry to do anything they can for SEO, it’s worth a try.